Yarka Classic Drawing Crayons are hard pastel sticks, 3/8" in diameter and 2-1/4" long, for use on paper, board, or primed canvas. They are made from high-grade pigments and Chasov Yar clay. 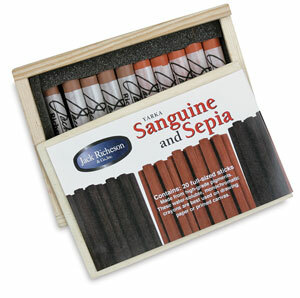 Sanguine is a Reddish-Brown color, much like Sienna, and Sepia is a Yellowish-Brown, resembling Umber. The set of 20 crayons includes 5 each of Light Sanguine, Dark Sanguine, Light Sepia, and Dark Sepia. Packaged in a varnished, slide-top wooden box.